Coconut flour pancakes seem lovely in theory, but often lead to a disappointing breakfast of dense, pale pucks of dough. These grain free pancakes, however, do justice to memories of Aunt Jemima’s chemical-filled goodness piled sky-high on breakfast plates. 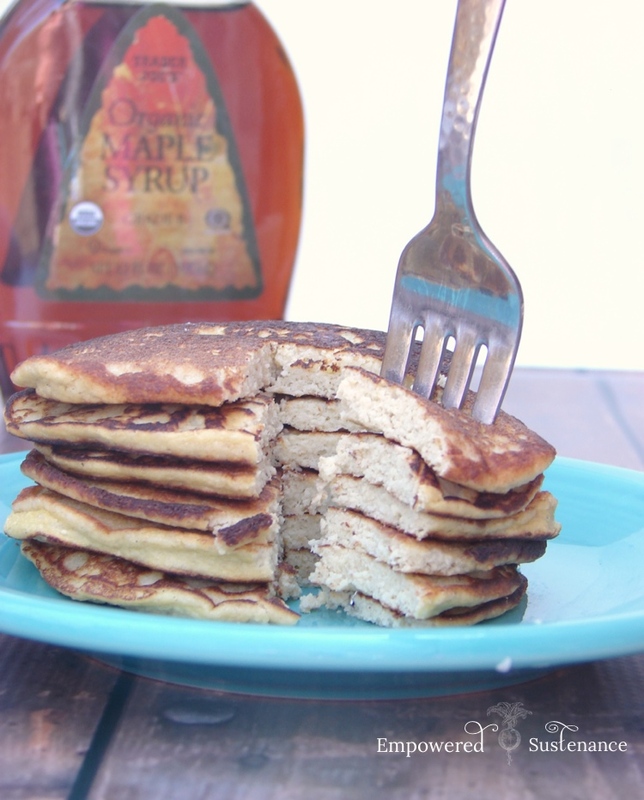 First secret to perfect coconut flour pancakes? It’s not really a secret, more of a widely accepted fact of coconut flour baked goods: use lots of eggs. Here, I use one egg per tablespoon of coconut flour. That seems excessive, but it helps the pancakes hold together. Next, I use applesauce for moisture. 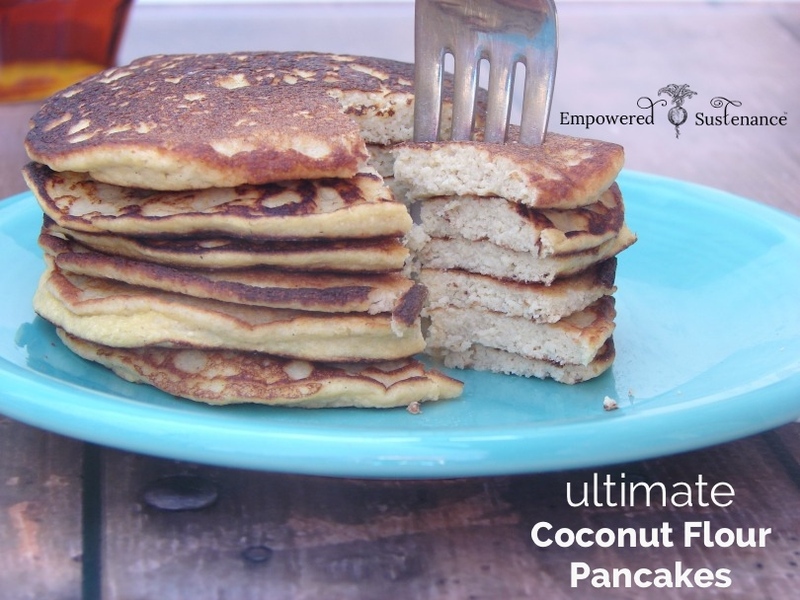 Often, coconut flour pancakes require mounds of butter and syrup to hide the dry texture–but not these! Finally, the combination of baking soda and vinegar adds lift to the pancake batter. Enjoy these coconut flour pancakes with traditional favorites like maple syrup, honey, applesauce or fresh fruit. One of my favorites is this creamy strawberry sauce, which requires only three ingredients. ! It calls for creamed coconut, and I use this (inexpensive) brand. You could also substitute coconut butter, if you have it. Heat a skillet (preferably cast iron) over medium high heat. Stir together the coconut flour and eggs until a smooth paste forms. Stir in the applesauce, oil, coconut milk, and stevia until smooth. Just before cooking, stir in the baking soda and vinegar. Add about a tablespoon of oil into the hot pan. Cook the pancakes in the skillet. For best results, make smallish pancakes so they are easier to flip. Top with syrup or Creamy Strawberry Sauce. To make the strawberry sauce, blend all ingredients in a food processor until creamy. OMG, these were awesome and easy to make. I used frozen peaches, as I didn’t have strawberries, and the ‘sauce’ was more of like a peach sorbet (definitely good to know when I’m craving ice cream!). Is it supposed to be cold and “sorbet-ish” in consistency? Thanks! Thanks Lauren! They’re a bit eggy but light and fluffy and great with maple syrup and a nice cup of hot tea! I should be eating totally GAPS but am having a hard time staying away from the gluten-free bread I’ve been eating for years. This recipe is a wonderful help to keep me away from that morning bagel habit! 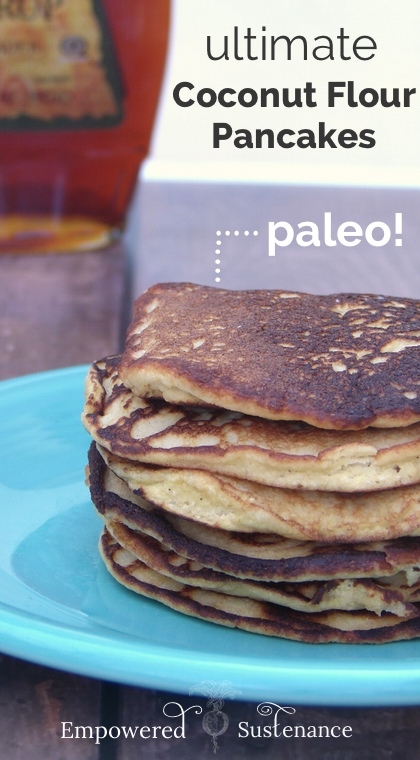 Thanks for your website and other paleo recipes! I’m slowly trying recipes from your 100 paleo breakfast ideas blog! Just made these this morning. My kids and I all enjoyed! We agreed that though a slightly different consistency, they were still good enough for Sunday breakfast, with maple syrup, or raspberry jam. I substituted mashed ripe banana for apple sauce, since it’s just not something in my pantry. Thanks for the recipe! I tried a similar one last nigh with banana which was great so will be trying this apple and cinamon yum ! Is it possible to put more creamed coconut in instaed of fruit ? I used to have coconut and strawberry oats alot but cant at the moment. Your “Creamy Strawberry Sauce” recipe to go with the Ultimate Coconut Flour Pancakes is not linked. Can you please share it? If I don’t have Apple sauce, what can I use? You can use sweet potato puree. You mention Stevia in the instructions but I don’t see it listed in the ingredients? How much stevia do you use?